Making pesto is easy and you only need a few simple ingredients to make this fresh and lively sauce. Tangy basil, toasty pine nuts and the bold flavor of garlic makes this sauce delectable. Once made, pesto stores in your refrigerator for up to a week or can be frozen for up to three months. Make some for yourself then for friends and family. They will thank you for it! The Romans ate a dish made with pounded herbs, garlic and cheese. It was called moretum. Basil was an ingredient that was not in the original dish. Basil was cultivated in India and eventually made its way to a section of Italy called Liguria. The Ligurians around the area of Genovese took basil along with olive oil and pine nuts and combined them with the Roman moretum recipe to get the pesto that we are familiar with today. Although pesto was introduced in to the United States in the mid 40's, it did not become a popular dish until the 1980's. Modern recipes for pesto include variations that substitute other herbs like cilantro for the basil and nuts like walnuts for pine nuts. This has a lot to do with availability and cost. Pine nuts can be expensive and substitute nuts like walnuts, cashews and almonds work just as well while imparting significantly different flavors. Pesto can be made with a mortar and pestle. This is the traditional way. It is faster to use a food processor. First garlic and pine nuts are pounded or blended into a smooth creamy consistency then basil is added until it incorporates smoothly with the garlic and pine nuts forming a paste. A little bit of extra virgin oil oil can be added to thin the sauce and achieve a more uniform blend. Salt and pepper are added to taste. Pecorino Romano cheese is added last. The cheese can be omitted if the sauce is intended to be frozen or stored in the refrigerator. Pesto tastes better when the cheese is added just before serving. This is a pesto recipe made as the ligurians make it. It uses regional ingredients. You can adapt ingredients as necessary. Try to use organic and fresh ingredients whenever possible. 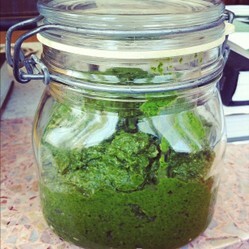 Process basil, oil, pine nuts, pecorino, and garlic in a food processor until smooth; season with salt. Use over cooked fettuccini, linguini or spaghetti. Toast baguette slices and spread with pesto for a quick appetizer. Vegetables like roasted potatoes or steamed green beans can be tossed in pesto then served. Combine with balsamic vinaigrette for a fresh salad dressing. Spread over chicken breasts or salmon fillets after grilling. Recipes from traditional to comfort food. Fast to make and recipes that are a labor of love. I know what I love to eat and I want to share it with you. "To love me is to feed me!" While chili dogs are popular across the nation, each region lays claim to different ingredients and toppings for their chili dogs. A chili dog from New York will be different from one in Arizona. Find regional recipes for this all time favorite; the chili cheese dog! Recipes for chili vary by region so there are many takes on this classic dish. The debate over putting beans in a chili recipe has gone on for at least a century. Which way do you sway? To bean or not to bean? This recipe is so easy and substitutions are simple. The chocolate chips can be substituted with white chocolate chips if there are allergies to chocolate. If it is vintage and collectible you will want to know about it. Vintage items are reviewed, discussed, defined, and displayed just for you! Vintage is hot. You won't miss a vintage beat with Pretty Miss Vintage. I love pesto. Gonna try to make this. Does look easy enough - but a bit messy. I adore pesto, but never thought about making it myself. Love the recipes, especially as they allow you to control how much salt is added (store pestos usually have too much salt in my experience).